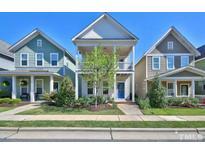 Below you can view all the homes for sale in the Briar Chapel subdivision located in Chapel Hill North Carolina. Listings in Briar Chapel are updated daily from data we receive from the Raleigh multiple listing service. To learn more about any of these homes or to receive custom notifications when a new property is listed for sale in Briar Chapel, give us a call at 919-759-5668. This home has an awesome butlers pantry, built in bookshelves, and screened in porch along with a nice community lap pool, fitness center and miles of maintained hiking and biking trails and close to shopping! MLS#2249518. 4273. Beautifully landscaped with amazingly quaint backyard. What a value! MLS#2249344. 62. Community pool, recreation facilities and walking trails. MLS#2248890. 2980. All in the most sought after new community in the Triangle. MLS#2248120. 2784. Corner lot with fenced yard and convenient to amenities. Welcome Home! MLS#2248075. 4655. One of the rare homes in BC with a finished walkout bsmnt that includes a guest suite w/an ensuite and expansive walk-in storage. MLS#2248090. 2611. Enjoy your meals or a cup of coffee on the generous screened porch, which has enough room for dining and separate seating! MLS#2247424. 81. Pre-sale; For comp purposes only! ! MLS#2247896. 3652. With a generous owner's suite upstairs, two additional bedrooms, a bright-and-sunny loft upstairs, fresh paint and new carpets throughout, and more - what's not to love? MLS#2247632. 25. Gorgeous home in Briar Chapel*Welcoming covered front porch*3 bedroom,2 1/2 bath*Hardwood floors on main level*Barn Door accesses office*Large kitchen island w/ granite countertops & stainless steel appliances*Custom built-ins made w/ locally sourced black walnut flank the fireplace in Family Room*Owners Suite has generous size Walk in Closet & large walk-in shower w/ bench seat*Covered Back Deck looks onto green backyard space*Exterior storage room*Home is steps away from Great Meadow Park, Swim & Tennis, & trails. MLS#2247635. 62. Outside enjoy your slice of heaven with a southern-facing-side-yard complete with a white picket fence, storage shed and deck. MLS#2246766. 25. Screen Porch & Stone Patio! Fenced Yard! MLS#2246004. 2016. Pre-sale for comps purposes. MLS#2245999. 2527. Pre-sale. For comp purposes. MLS#2245732. 2527. Pre-sale for comp purposes only. MLS#2245697. 2527. Pre-sale for comps purposes only. MLS#2245706. 2527. Playrooms on 2nd & 3rd fl. Office on 3rd. Must see! MLS#2244973. 118. Attached 2 car garage is accessed through the alleyway. MLS#2244342. 81. HOA fees include yard maintenance, pool and club. MLS#2245072. 136. All systems are less than 5 years old. MLS#2245107. 4631. Close to all neighborhood schools and Great Meadow Park! MLS#2244997. 2731. Featuring hardwood floors on the main level, as well as plantation shutters throughout the interior (even the screened outdoor living space), this house maintains the level of refinement found in many custom-built homes. MLS#2244905. 81. Bsmnt w/Bedroom & bath. Deck, patio, & scrnd porch. MLS#2243213. 4498.